Nice State of the Art Ship, Many Features but no Butter? 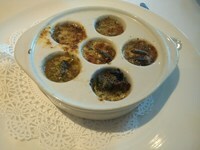 S-car-go right down the hatch (Escargot). *If you find anything useful in all the time and effort to putting this review together, please let us know with a helpful vote! Personal Background Information-We are a family of 4 with my little ones ages 4 and 1. This is my 9th cruise (6th for my 4 year old). Travel To Port of Embarkation-We stayed at the Roadway Inn (around $100) and admit we were kinda worried about some of the reviews it gets. We usually don’t mind spending a little extra for the nicer hotels but given the prices of the local hotels and the fact that most do not offer shuttles to/from the port and airport, we decided this was our best option. We found the hotel to be perfect for our needs, my boy absolutely loved it! The very well-kept courtyard with the alligator and tortoise was a big hit. Tile floors could have been cleaner (dirty feet). Has a sports bar at the hotel and a big breakfast bar with large seating area inside and out. All shuttles (Mercedes Benz) were prompt and the lady driver was A++! Embarkation-We arrived early since check out was well before official boarding. I thought that the shuttle might have dropped us off at a retirement home, seriously, I don’t think I saw a single worker under 60. It went great though, besides a couple grumpy grandpas, everyone was nice and I think the only line we had to wait was maybe 15 minutes to get our sign and sale cards. Ship Info-I was disappointed that to find out this ship did not have their medallion active yet, seems like they are pulling back from this convenience, but expensive upgrade. Dining-We mostly ate in the dining room as we do not enjoy the ‘fight’ for food in the buffet as well as the wonderful mile long lines, but what?? Hardly ever a line?? Ok, this blew my mind… How do you have 4,000 passengers and the buffet not be a madhouse? I don’t how they did it but hardly any lines, short if there was a popular item which made the buffet bearable. Most of the food was good with a different theme to change things up. Our boy loved going to Discovery Camp whenever we would let him go. They had a different activity theme daily and not some cheap junk. He got a real cowboy style hat, nice stuffed animals, and pirate garb such as the hat, face paint, etc. The problem is leaving half my stuff on the ship to make room for all this crap. Not much for our 1 year old but was well taken care of by the wait staff. 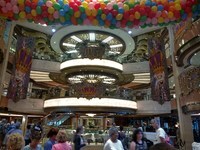 Staff & Service-always exceptional, better than my last cruise on the MSC Divina. Oleg and head waiter Conrad did a great job in the dining room. Really made dining a treat. Entertainment-Ok, this is no joke… If you arrive to a show 30 minutes early you MIGHT get a single seat in a blocked view location (far left and far right seating are very obstructed). We had to leave because my wife and I could not find seats and we were 20 minutes early… Even showing up 60 minutes early, the seats left weren’t all the great. There is no crossover isle, so if there is no seating on one side, you either leave the theater and enter the other side or to the stage and cross over there. St Thomas: We booked an Island tour on in an open air ‘bus’. Really it was benches attached to the bed of and old Ford pickup (see pic) I mean they did a good job but that’s really all it is. If you have any issues with heights and no door, you need to get in first as the ‘passenger’ side is closed and the ‘drivers’ side is pretty much wide open (that’s where I sat but didn’t bother me). You go up some steep roads and small roads so just be prepared. Martinique: After trying to get a price from a cab to get an island tour and said $450 we just walked away as the gap was way way off from what we were going to pay. We decided to pay $8 to ride the ferry to the beach. My boy and I apparently were the only one’s who enjoyed it because we were combing the beach for sea glass. Granada: We booked a private tour van that took us on a 3+ tour for $60 for 4 adults and 2 kids what was supposed to be an air conditioned van. Not sure if it was air conditioned as he never turned it on. Bonaire: The semi sub was really neat way to see the beautiful underwater life and stay dry for $25 but all they had for air is a fan, so it was very stuffy. Curacao: We walked off the ship and they have a booth that are yelling at you to get you to book with them... costs us only $20 pp (i think our 4 year old was free). Very good open air bus island tour. The private beach is absolutely beautiful that is something like $7. 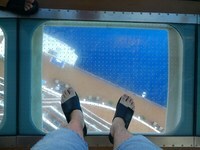 Disembarkation-Very fast and very smooth. We had a hotel and were in no hurry, so we at breakfast in the dining room until they kicked us out of there, then hung out in our assigned area until we were kicked out of there too. The wonderful Roadway Inn had someone the take care of us when we got off the ship, directing us where to wait, and helping with luggage as he could. The shuttle arrived in around 20 minutes and got us where we needed to go. It really was the best pick up experience I’ve ever had; so easy, well planned and worry free. Room-Mini Suite: We paid $250 that moved us up from a balcony cabin (D630) to a mini suite (R230). We have 2 little ones, so the extra space for them was amazing. We loved the privacy curtain separating the “living” space from the bed. The kids slept in the living space and we could pull the heavy curtain to watch TV and not disturb them. Bed=Bed are always super comfy. Pillows=Fine I guess, I always bring my own shredded memory foam pillow. Heating and air= In port, the air was not as good and we had to turn it down, but once we went to sea the temperature would drop drastically. Metal walls= We were able to use our magnets on all exterior walls as well as ceiling but not the door. Shower size= This has a full size tub and shower, a really nice perk that comes with the mini-suite. Noise= The location of this cabin was excellent with no noticeable noise. Smoking= Handled very well on this ship, probably the best I’ve ever been on. Of course they have the typical ‘have to go through the smoking casino to get to the dining room’ route, but we just learned to go past that area and use the back elevator/stairs to avoid the walk through. Smooth= very smooth ride and I don’t if it’s true or not but someone said they never even put out the stabilizer fins. Ship GPS= Loved it! The interactive TV was simply awesome. It was very accurate and you can zoom in or pan out. Internet=Only use the free ‘buddy’ app and looking at other cruises on my LT with no problems. Dining- I’m just going to hit the highs and lows. We dined mostly in the in the dining room for dinner, mostly in the buffet for breakfast and lunch as we usually avoid the mile long lines like the plague; but what’s that?? No lines at the buffet?!? So I don’t know what magic formula they used to keep 4,000 people fed with hardly any but this just simply blew my mind! The food on the buffet was pretty good, they did a pretty good job keeping things fresh and the food in the dining room was better, sometimes very good. 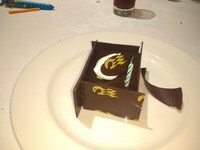 HIGHS-It was my birthday and they sing and give you this delicious little Princess (logo) birthday cake with what looks to be real gold (see pic). 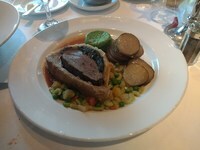 The beef Wellington was excellent on lobster night (see lows) and the Escargot was very good too (see pic). I’ll let you in an awesome (well, for me) secret about the daily lunch buffet. At the port side at the beginning of the buffet, for a short time they have Gyro meat with all the fixings to make a wrap, salad, etc. Get there right early because it goes quick. The fresh waffles in the buffet are good and you usually do have to wait for those, but are worth the wait. Cornflake French toast is to die for! The link sausage is very good with the natural (I think) casing. LOWS-So let’s talk about the lobster. It was small, in fact I would say the lobster and shrimp where about the same size (see pic). Not the worse I’ve tasted but not great either. They don’t shell the lobster as they used to, just set it down and gone for 20-30 minutes. I know this because I wanted to ask for drawn butter. I was told they don’t serve drawn butter! WHAT?!? So you go to the expense to serve lobster with no drawn butter… seriously?! I was told it’s already on it (um, no it wasn’t since it sucked all the moisture from my mouth). They should tell you this up front so I can put a pat of butter on it instead of letting it get cold waiting to be told they don’t have drawn butter. Another interesting tidbit; they had lobster leftover (surprise, surprise) and served it for lunch all the way in the back of the buffet with the other seafood until it ran out (No, I did not partake). Surprised the burger from the dining room was lousy, seemed baked but by the pool was good. The Pancakes are always horrible. All this advanced technology and the only way to see what they are serving for the day to go to the dining room as look at the menu. 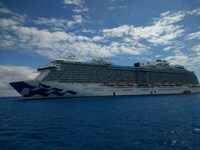 We had a great cruise on the Royal Princess especially loved the Mini suite upcharge opportunity. Staff is always wonderful with the kids and the food and entertainment is always good on the Princess ships but this was better. For the $1738 + Gratuities, I would jump at the chance to do it again. I removed the gratuity from the baby and passed it according to the people who served him. *only put in new things, no sense grading the same thing I ate every day. We really liked the cabin and its location, close to elevators but far enough away for it to be quiet. We have 2 little ones, so the extra space for them was amazing. We loved the privacy curtain separating the “living” space from the bed. The kids slept in the living space and we could pull the heavy curtain to watch TV and not disturb them. As you can see from the pic, kids enjoy it too. Very good open air bus island tour (see pic). The private beach is absolutely beautiful that is something like $7. It was busy, of course but the hotel shuttle got us within 50 yards or so to the building. Under cover is nice if it&apos;s raining but very loud, lots of honking and a lot of trapped exhaust fumes. Granada: While in the mall, we haggled a private tour van that took us on a 3+ tour for $60 for 4 adults and 2 kids what was supposed to be an air conditioned van. Not sure if it was air conditioned as he never turned it on but left the windows down. It wasn&apos;t too hot until the way back to the ship. Nice beaches that aren&apos;t too crowed... large enough that you can get away from the crowd if you wish. Good place to snorkel. The cookout they do for you is good but lots of flies.